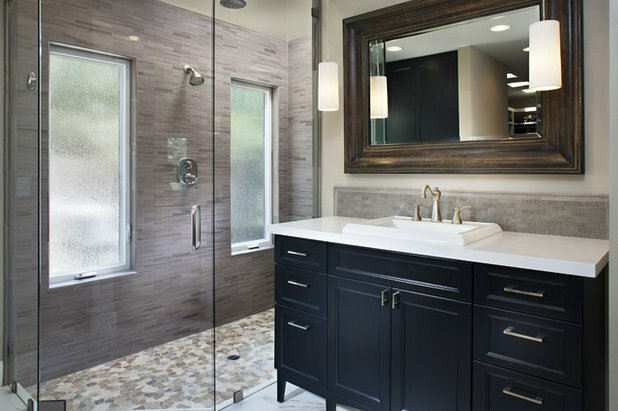 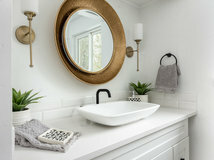 We get many questions from Houzz users asking us where they can get this or that bathroom vanity, and often the answer is that the vanity is a custom or semi-custom piece, not a standalone readymade piece. 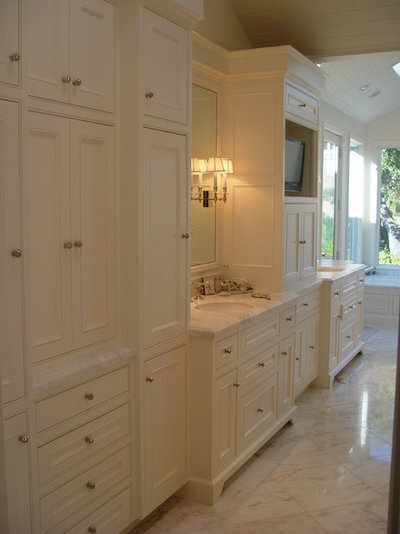 But even when vanities are assembled from stock cabinets, you can achieve a very custom look by adding a few furniture style details. 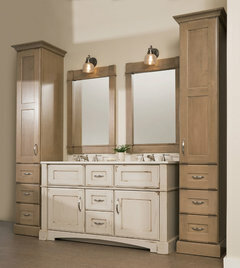 These vanities may look like freestanding pieces of furniture, but they're anything but. 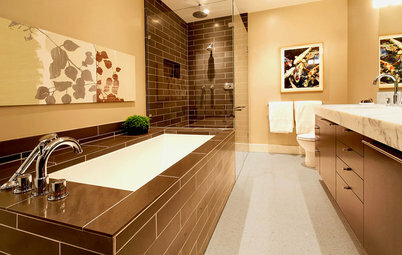 Here's a few of my favorite examples, with a few freestanding retail options as well. 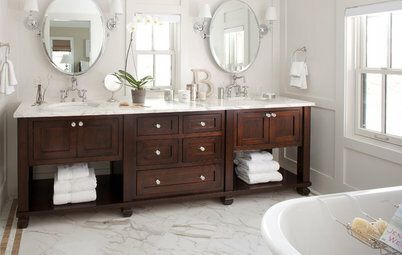 Furniture-style legs: This vanity might look like a piece of furniture, but it's all in the styling. 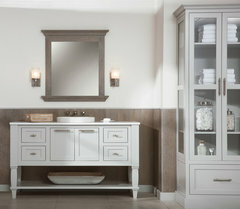 Pilaster-style legs, detailed feet, the varied heights of each cabinet, the flush inset construction: All these elements are critical in making this vanity look and feel like a piece of furniture. 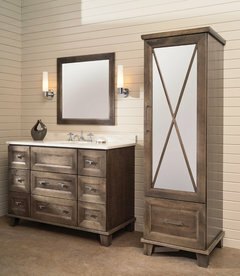 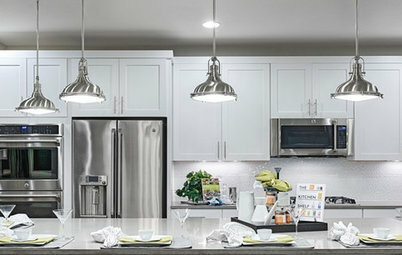 Tip: The reason that vanities similar to the one shown here aren't available off the shelf in stores or online is often due to size. 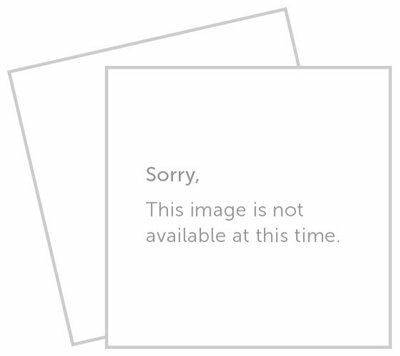 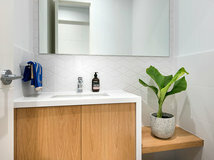 You might see a 48" single-bowl, furniture-style vanity available as a readymade product, but a vanity such as the one shown in this photo is designed to fit the space exactly — "fitted" precisely between two walls. 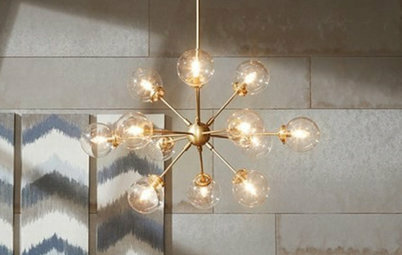 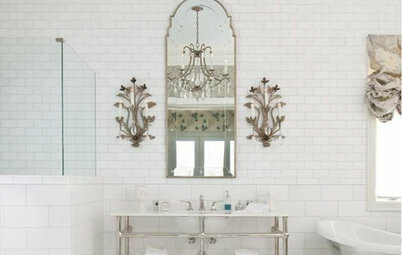 Furniture style doesn't have to be super-ornate. 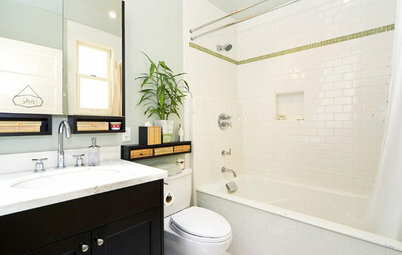 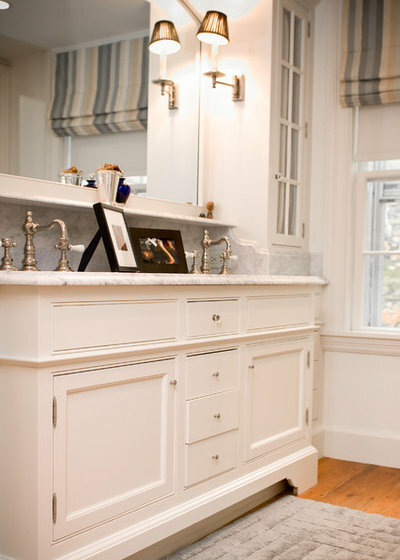 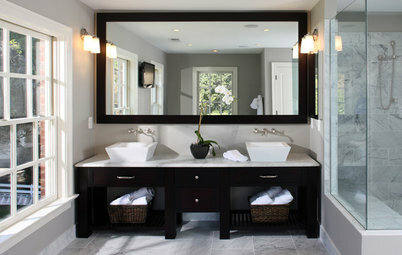 The simple addition of legs that raise the cabinet off the floor transforms a vanity into a piece of furniture. 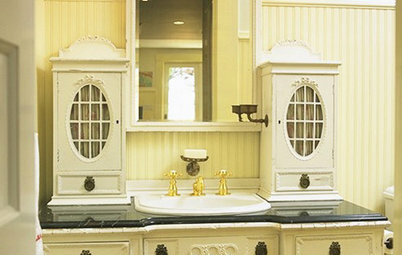 Tip: Analyzing the details of a favorite antique sideboard or dining room credenza can help you to design a custom, furniture-style vanity of your own. 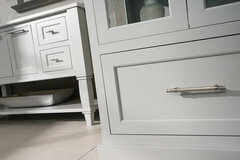 Furniture base molding. 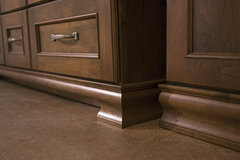 If seeing (and cleaning) under a bathroom cabinet just isn't your cup of tea, there's always this option: furniture base moulding combined with a recessed toekick behind so you don't have clean under the cabinets. 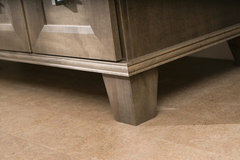 From eye level, you can't even see the recessed toekick behind the the furniture base, but it tricks you into thinking the cabinets are standing on feet. 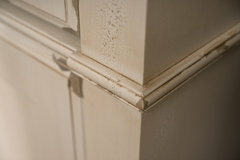 Decorative molding details. 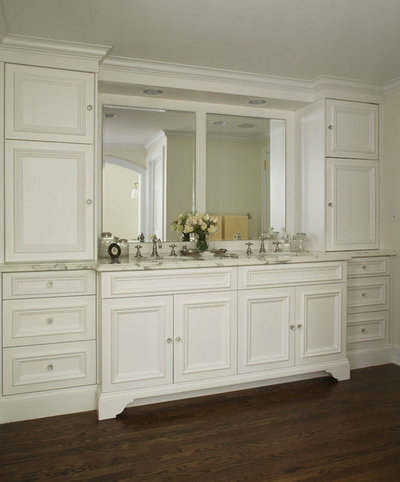 The simple addition of a piece of molding between the upper drawers and lower doors adds a level of detail you don't see on a standard stock cabinet. 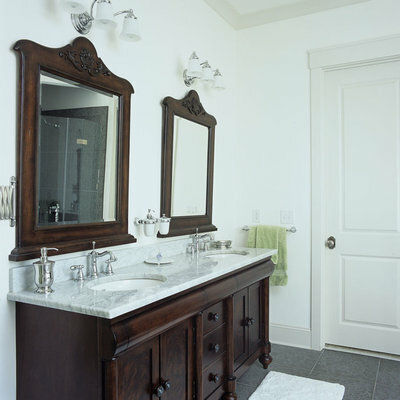 The molding and base molding transforms this into a furniture-style piece. 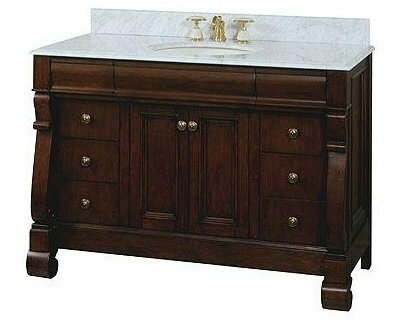 If a custom-made vanity isn't in your future, and you're looking for a readymade furniture style vanity, there are a few on the market, like this one from Fairmont Designs, that are pretty terrific. 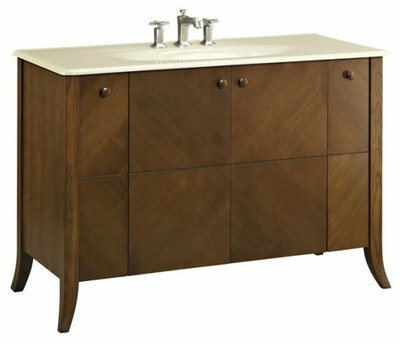 Love the veneer pattern of this from Kohler. 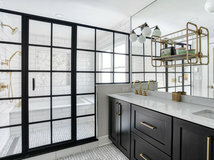 It’s not easy to find a readymade double bowl vanity cabinet, and Restoration Hardware has made that a bit easier on us all by offering a handful of styles and sizes.